Apple today made iOS 11.3 available as an initial beta release, giving developers a chance to check out what they will be developing apps against this year. The update will be a rather large mid-cycle update to iOS, meaning developers will need to take notice of what is changing. Users too can expect some big differences with the arrival of iOS 11.3 this Spring, with Messages on iCloud and a new focus on privacy top of the list. Kicking things off with a feature that had been promised before during the initial beta of iOS 11 and then disappeared from the radar, Messages on iCloud is finally back. No information has been made available from Apple as to its inclusion, but its arrival will certainly be well received by many. 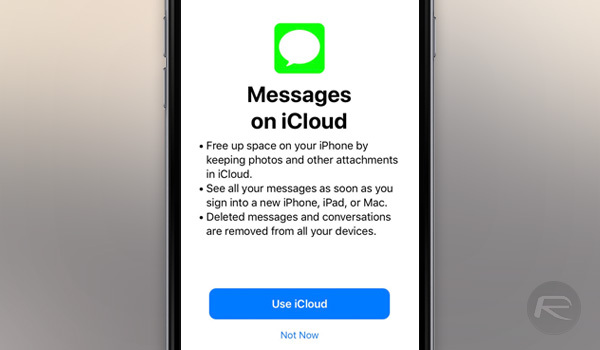 With Messages on iCloud enabled, users will be able to view their entire message history across all devices, even after they were disconnected from the network – messages will be re-synced when a connection is re-established. The ability to have the same iMessage messages on all devices, all the time, is something that many had expected to arrive long before now, and quite frankly, it really shouldn’t have taken Apple this long to get a simple feature such as message syncing into the iPhone. Still, assuming it does not do another disappearing act after this initial iOS 11.3 beta, users can look forward to its arrival soon-ish. Alongside the new Messages functionality, Apple has also added a new icon that will be displayed whenever an app is requesting what Apple deems to be personal data. A screen within iOS 11.3 beta 1 explains just what this means, outlining how Apple aims to protect a user’s data. This is a feature that we definitely expect to find its way into iOS 11.3 when it is released this Spring, and one that privacy advocates will certainly welcome. No such thing as privacy when it is closed source.